Satellites are not forever. Intelsat I, the first commercial communications satellite placed in geosynchronous orbit, operated continuously only from 1965 to 1969, about a fifth of the life span of a contemporary equivalent. But the 2 1/2- foot-by-2-foot device, nicknamed “Early Bird,” enjoyed a longer run than will “Satellite,” the installation by Workingman Collective. The local collaborative-art group, whose core members are Tom Ashcraft and Peter Winant, began constructing an oversize wooden model of Intelsat I in April. The sculpture will be on display in a vacant storefront at 17th and L streets NW until the end of the month, when it will literally disappear. Because the doors are too small to accommodate the mock satellite, the artists must disassemble it to remove it. The piece’s imminent destruction suggests Intelsat I’s short functional life, as well as the increasingly hasty obsolescence of all new technologies. Satellites from the 1960s, like cellphones from the 2000s, are relics of our restless age. 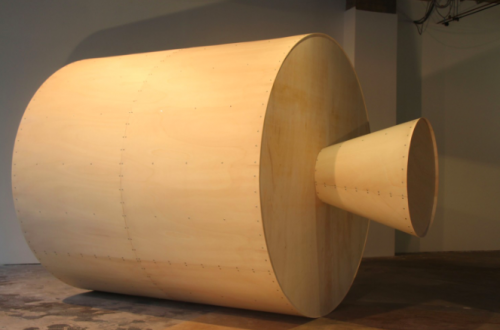 “Satellite” is a simple piece: a cylinder and an attached cone, made of unpainted, screwed-together plywood. The sculpture is set off merely by a square of blue painted on the white wall behind it. Originally, the artists planned what Winant calls a “more baroque” setting, with elaborate lighting. Gradually, they pared it down to a few shop lights and a lone square. “This is just a basic piece of geometry that we hope implies distance and space,” he says. A satellite at Farragut Square might seem incongruous, but it connects to a local institution: Intelsat, which began in 1964 as an intergovernmental consortium and was privatized in 2001. Last year, the company moved its main operations from downtown to Tysons Corner, where it leases space in an office tower between a new Metro station and the venerable shopping mall. Connecting the Metro stop, the building and the mall is a new plaza, dotted with life-size bronze models of birds. They were fabricated by Workingman Collective, which originally proposed throwing a bronze Early Bird model into the avian mix, in honor of Intelsat. The plaza’s developers, however, “were not into that,” Ashcraft says. Not long after they made the birds, the collective’s members were offered the downtown temporary space, which is owned by Lenkin Co. and managed by Hemphill Fine Arts, a D.C. gallery. Understandably, the artists thought of building a satellite. Made not of bronze, but plywood. It’s a humorous choice for a model of something high tech — or at least something that was high tech 50 years ago. It also suited the ephemeral nature of the project, and Ashcraft and Winant’s collective history. The use of carpentry rather than computers links the wooden satellite to the early days of space gizmos, which were often handmade from everyday materials. “Today, the machines make the machines,” Winant notes. In constructing an Early Bird satellite that would be dramatically bigger than the original, the artists were guided by how the finished object would fit the storefront’s raw space, and how it would appear from outside. Intuitively, they also chose the right size for their physical limitations. “Satellite” can be seen from outside the space and is more visible at night than in the daytime. (The piece also is viewable by appointment.) But the artists have held some events in the space, hosting musicians and poets and — during the opening — serving waffles. Inviting outsiders into their space is a Workingman Collective trademark and another aspect of their dedication to collaboration. Plus, Ashcraft notes, it allows others’ observations to color the intentionally blank canvas of the plywood satellite.